This post breaks new ground for me. My week at the Acres USA Eco-Farming conference was both life-changing and reaffirming, and made me realize that everything I do, even here in suburban San Diego waiting for the retirement bell to ring so I can head to Kentucky and get started, is about my farming. The story has begun, and this part of it, this preamble to the Great Beginning, needs telling too. For some reason, up to this point I thought my posts had to be about the farm, or strictly farm-related, in order to be relevant to this blog. Having told my story to dozens of fellow farmers, I’m seeing it differently now. My journey to the farm is the current chapter, which includes everything I’m doing here in suburbia to make the transition to farming in Kentucky. I’ve even taken to calling my curbside homestead “Bear and Thistle West” because it is in all ways my West Coast farmhouse on 1/8 of an acre, where we eat food grown and cooked by hand, preserve the harvest overflow, make soil, manage rainfall, and build skills and collect tools needed for farming. The reality is, I am a farmer, whether I’m here on Redlands Place in Bonita, CA or on Knifley Rd in Elk Horn, KY. At the rate things have been going, these last couple of years will fly by like birds trying to beat the winter weather; every day, then, I am trying to do something that brings me closer to starting my farm. So I’ll write about that. As for the conference, my brain couldn’t have taken another day of lectures and workshops; there was so much good material, so many good speakers. I’ll discuss the high points as I find time, as I have several posts drafted and will work on them as I can. The conference wrapped up Saturday evening and I escaped the frozen north in the nick of time, heading back to Bear and Thistle West just before the vicious winter storm plowed across the Midwest, closing freeways and causing havoc for travellers. Yesterday we finally got a taste of what passes for winter weather here in SoCal: heavy rain and wind, terrific gusting wind. My high-tech rain gauge – a widemouth pint mason jar – measured 2.5 inches, quite a lot for this area, and much needed. It’ll knock down the fire danger for awhile, and the moisture is appreciated by yards and gardens, and farms, too. Yes, farms, and close by, hallelujia. Seems we have a new start-up, a local organic CSA farm south of San Diego, nearly on the Mexican border. I stumbled across Suzy’s Farm website by accident and was delighted to read that they have a farmstand, since my winter backyard garden is just getting going (we garden all winter long here at 32 deg lattitude) and I’m always looking for good organic vegetables. So I called, and Rodrigo said no, the farmstand wasn’t open, but come on by the warehouse, I could buy there. So off into the pouring rain I went. Looking for carrots to juice, mostly, but ready for just about anything. And as it turned out, carrots weren’t picked, but they had lots and lots of every other thing. I bagged two bunches of chard, two bunches of long beets, a handful of those lovely purple-necked scallions, a bag of round zuchinnis, a pumpkin (for pie), a buttercup squash, and six cabbages. Yes, I said six. Cabbages. For sauerkraut, of course. 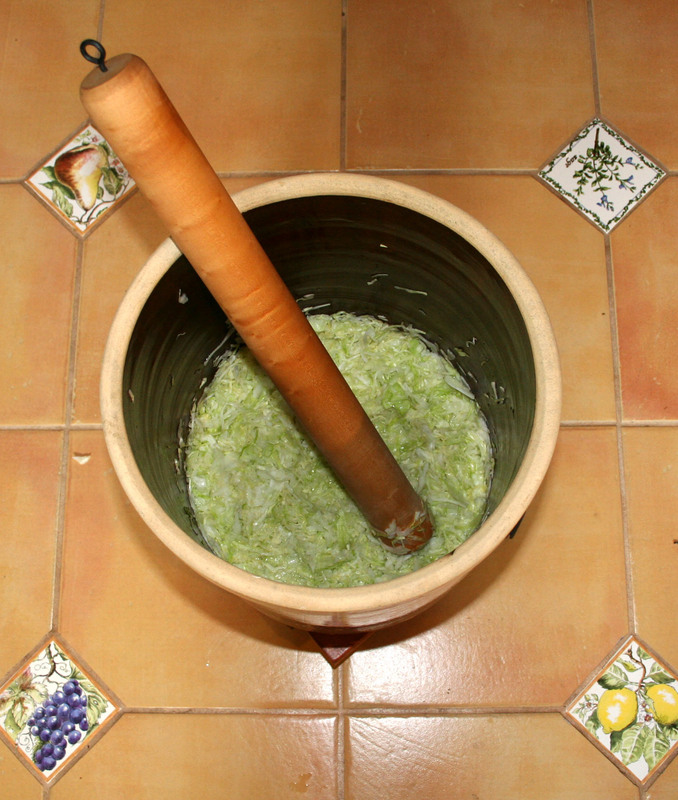 It’s been a long, long time since I’ve made sauerkraut. Like, 25 years, give or take a few. I still have my old 5-gallon ceramic crock, which serves nicely for brining turkeys but hasn’t seen a leaf of cabbage for years. 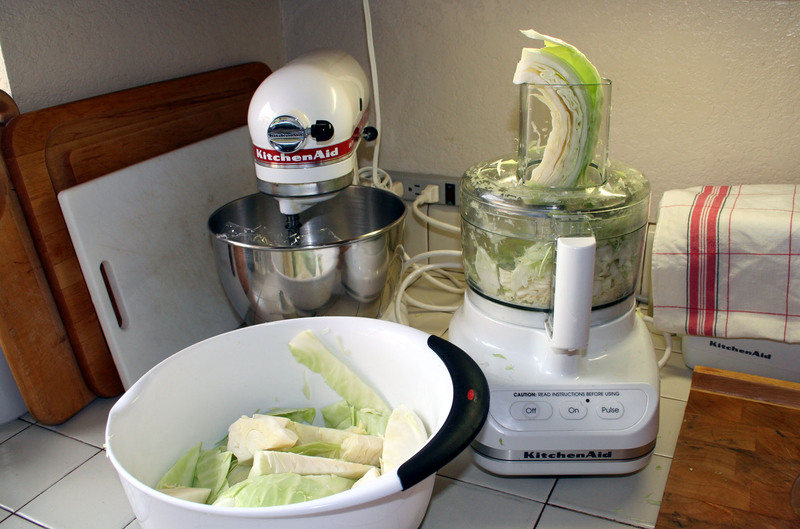 This time around, I had the help of my trusty food processor, which made the shredding of 20 lbs of cabbage a very simple task. Absolutely nothing to it. 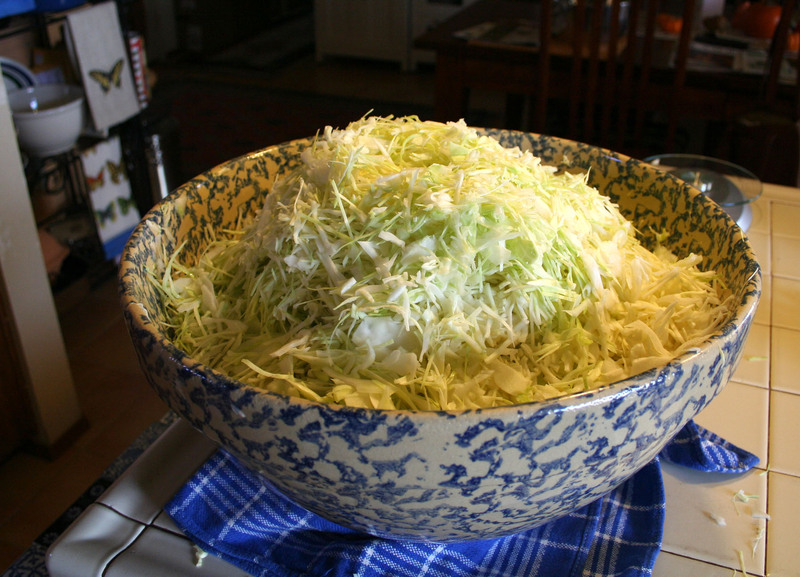 And the giant ceramic bowl I bought in a Fallon, NV feed store, thinking a bowl that large would surely come in handy some day, was just perfect for salting and mixing the mounds of shredded cabbage. My hands ended up being the packing tool of choice, and now the crock is filled with kraut, covered with brine and weighted down, and we’re waiting for fermentation to start. Some books say it will be finished in 3 to 6 weeks, others note that the flavor gets more complex the longer it goes, and 6 months is not too long. I can’t remember how long my first batch developed, so it’s like I’m doing this for the first time. I believe I’ll sample a little over the New Year’s holiday, and pair it with whatever clean meat I’m able to find. Now if I could only find a local farm that raises pastured pork!